The blogs are too much IN these days, and you cannot live in the state of the denial anymore…. This statement indeed fits the bill very well today, wherein marketing rules the business strategy for every domain and blogs, which is a very much part of the content marketing, and is leading the game of every business across the globe. How many times as a blogger, you wrote, invested your passion entire day and at the end, you reduced to sobs, while knowing that your blog is not receiving the attention, you were expecting from it. Many bloggers do write and gain attention, but many bloggers write, but their blogs remain on the 3rd and the 4th page of Google search result and despite having enough weightage, these bloggers are never able to garner the attention of targeted audience on their respective blogs. It is indeed heart crushing fact, but it does happen on daily basis, and we all go through this, but what are the measures to overcome this issue? What are the ways to increase the Blog traffic? The only aspect which keeps on troubling you constantly as a blogger, that what lacks in my writing? Am I writing too much out of the context? What am I missing out on largely in my content quality? But looking at the content, when you find the content is quality enriched, then why there is no considerable blog traffic occurring? if this issue you too are dealing with then reading ahead would certainly be a beneficial aspect for you. Gone are the days, when writing a blog once in a week, could save you from the dreadful situation of losing the blog traffic, so in order to get over this issue, you need to write more often than before, this would help your blog to get its audience through the solution-offering blog. 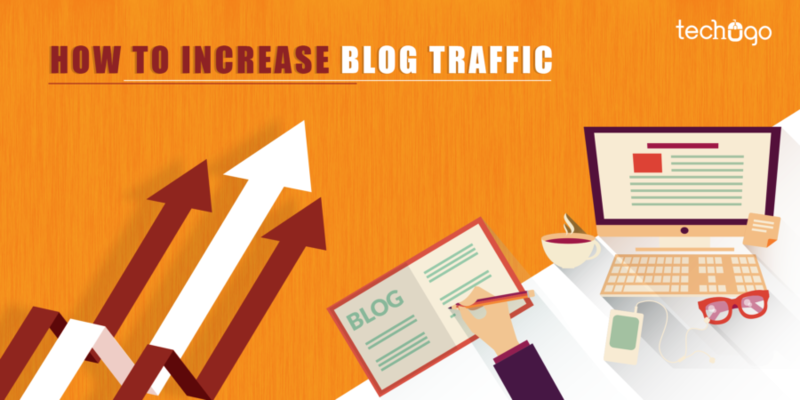 Also the moment you increase the number of blogs, ultimately your content is recognized by Google, helping you increase the visibility chances further. When a blog is posted, it is often strategized with a plan to post once and then forget, but eventually you don’t need to sleep on your blog after posting it once on the different media channels, rather post and share more than once. Albeit, many marketers consider this factor full of arguments, but you don’t need to fall for this confusion trap, believe me it does really help your content to get visible, and update your audience with the essential information required by them. A blog becomes highly recognizable due to its quality of content, the solution it provides and the tags it consists of. YES, I said tags, it might seem a useless activity to you, but you need to understand, these tags, can help your blog to be highlighted and noticed by the average reader, who is looking for the required information, through tags. Don’t miss on the tags, rather search for the pertinent tags, which can be posted along with the blog post. It not just helps the users to find your blog post, but also the search engines take a worthy clue from it. The very first time I heard of the keyword, I found it little finicky and could not relate to it, but sooner I realized, what is the real worth of the keywords, when I searched more about it deeply. A keyword is something, which makes your targeted audience to locate your blog effortlessly, so you need to understand that the accurate keywords must be inserted within the blog and should not be over-used though, so make it a practice to garner the view from the targeted audience through the right set of keywords as a part of your writing. SEO- search engine optimization is a serious job, and you cannot take it for granted at any cost. When a piece of writing in the form of blog/article/small write-up or any other ways is shared on the internet, this writing has to be optimized for the SEO to be found further by the search engines. SEO lets you control the correct dosage and the number of targeted keywords to be inserted in the blog, so the wrong usage would not lead to blog rejection from the Google. So integrate SEO to boost the targeted audience on your blog page. A blog is a mere piece of writing, which only a number of readers would prefer to read ahead, but adding a hue of colors and images- depicting the analytical view, would help your blog to be liked and appreciated further by the readers in abundance. It is shocking but a fact that many readers feel bound to open your blog, depending on the images shown in the banner. There are various portal offering the forum chats, herein you can always share a link to your blog, and write a few attractive words about it, increasing the chances of getting clicked and liked by a huge number of readers, who would turn into your loyal readers. Indeed the good content is irreplaceable, but to make the good content to be noticed, you need certain strategies, which would only help you to increase the blog traffic and of course a curve line on your face. On the other hand if you are considering to give a shot to Content Marketing+ SEO services, then suggesting a sordid option to you, would be an absolute NO from my end, so I have brought a trusted mobile app development company in India- Techugo for you, which not just caters the mobile app development services but the digital marketing services to the clients across the globe.